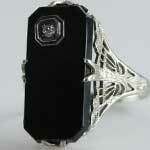 Antique black onyx white gold filigree ring with a pierced diamond center. 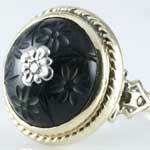 Enjoy this very pretty round estate black onyx ring with engraved flowers in yellow gold. 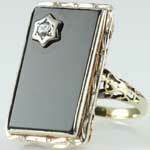 Delicate ladies antique black onyx 14kt white gold filigree ring in a rectangular shape. 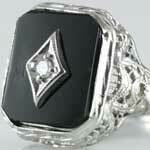 This big, long estate black onyx diamond gold ring is amazing. 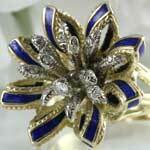 This flashy large blue enamel flower estate ring has a dazzling diamond center - all in gold. 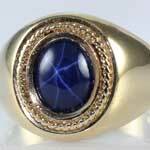 Blue star sapphire ring in simple braided 18kt 750 yellow gold mounting ( 2 carat). 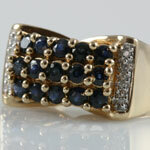 A vision of three rows of dark blue topaz with diamond borders are found in this 14kt yellow gold vintage ring. 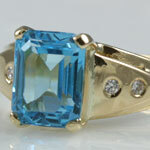 Stunning blue topaz and diamond vintage ring in 18kt yellow gold. 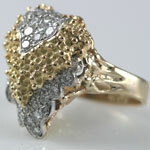 This bold 14kt yellow gold diamond ring is shaped in an artistic heavy leaf shaped design. 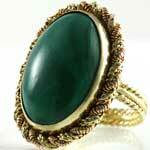 Daring big green malachite in an 18kt yellow gold braided ring mount. 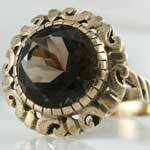 Fantastic 5 carat dark brown smoky quartz 14kt ( 585 ) yellow gold estate ring. 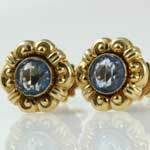 Gorgeous estate Bucherer aquamarine 18kt yellow gold screw back pierced earrings.